It's well into the evening now for most of the US, so presumably the bloody melee that is retail Black Friday sales is mostly over. If you've set your broken bones and patched up your bruises and you're still itching for some deals, the big box online stores are still offering discounts on MicroSD card storage, plus SanDisk's Wi-Fi-powered flash storage devices. Let's break it down by retailer, shall we? Unlike some of my colleagues in the tech media, I don't have any particular beef with Walmart. Yes, they sell cheap imported crap, and yes, they under-pay their employees, stiffing both the people who make stuff and the people who sell stuff. But if you object to that strongly enough to actually change your buying habits, you'll soon run out of places to buy things. I do, however, object to the idea of a mobile payment system that works at exactly one store. That's taking the biggest problem with mobile payments as a whole, the lack of inter-operability, and turning it into a selling point. I don't think anyone realized just how widespread Google's Cardboard "virtual reality" standard would become when it was first announced. And as neat as some of the games and apps that use Cardboard are, it's hard to escape the fact that the headsets are, well, made of cardboard. 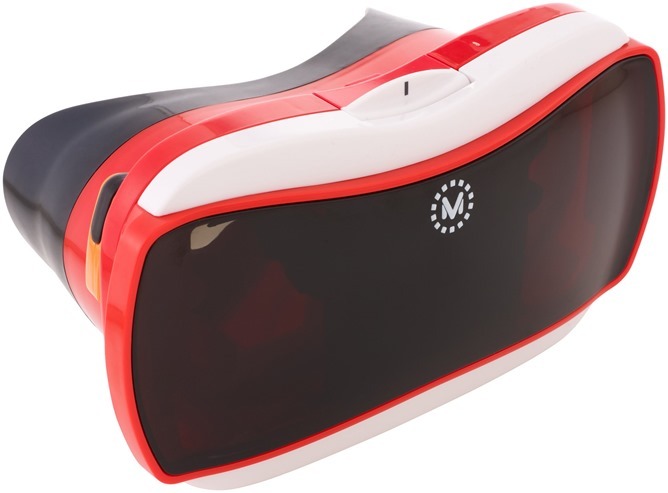 If you'd like something more sturdy (without having to buy a new LG phone), you can grab one of Mattel's revitalized View-Master VR toys. The original price was a bit steep at thirty bucks, but today Amazon and Wal-Mart are selling them for $19.97, a little closer to impulse buy range and pretty decent stocking-stuffers to boot. Hurry up, ladies and gentlemen! 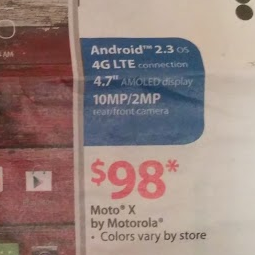 If you sprint to Walmart between November 20th and 26th, you can apparently pick yourself up a very vintage Moto X running none other than Android 2.3. Those on-screen buttons and #HOLOYOLO accents look pretty spiffy on this fine Gingerbread device, don't they? Curiously, on November 29th, the same phone not only drops to half price for Black Friday, it also gets a ninja upgrade to Android 4.2 and a $100 Walmart gift card (which is actually a pretty good deal since you're effectively netting 50 bucks - after signing a contract, of course). The mention of "Android 2.3" also made it to the printed circulars (thanks, Stephen Scott! Monster gets a bad rap from the technology community, but in all fairness, they absolutely deserve it. Between ridiculously overpriced home theater components and insanely malicious trademark lawsuits, the company is probably the most-hated technology corp this side of Electronic Arts. 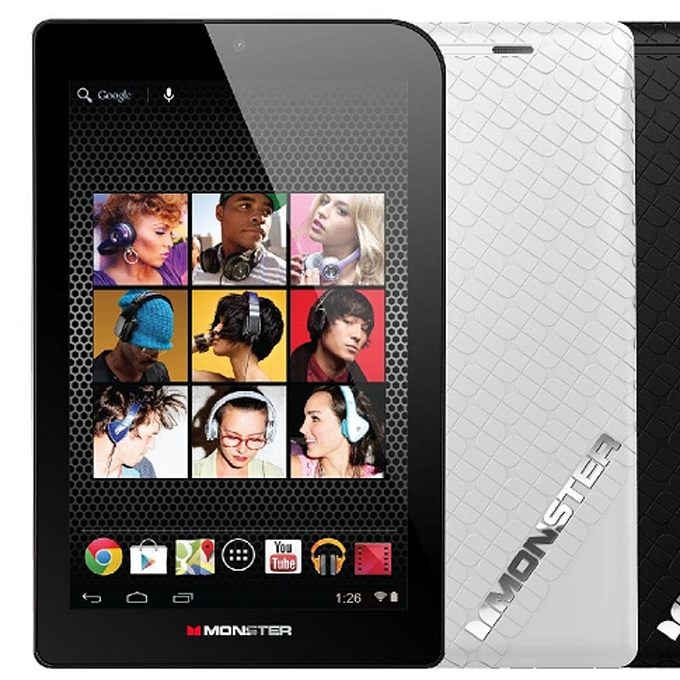 Having said all that, Monster announced its first Android tablet today, the 7", $149 M7. The combination of branding and price is incongruous to say the least. The tablet fits pretty well into the budget 7-inch mold - you could probably guess the specs, which include a 1280x800 screen, a 1.5GHz dual-core processor, 1GB of RAM, a 5MP rear camera, and 16GB of storage plus a MicroSD card slot. 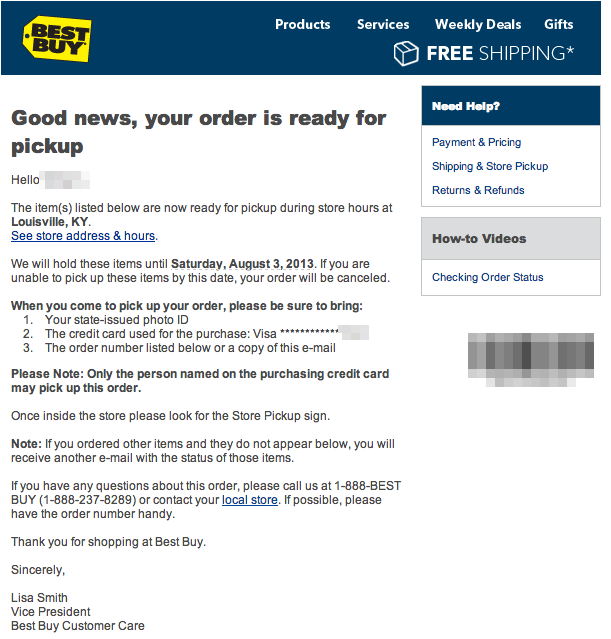 If you've ordered the 2013 Nexus 7 model from Best Buy, check your email - at least one Android Police staff member has received confirmation that the new tablet is ready for in-store pickup. Twitter was alight last night and this morning with some retail customers who managed to snag one off the shelves as well. Both 16GB and 32GB models are apparently being sold freely at at least some brick-and-mortar locations, at the standard $229 and $269 prices. The Verge reports that at least one Wal-Mart store in Monroe, New York is selling retail units, and Amazon is offering 2-day shipping for July 30th, 1-day shipping for July 29th, and Saturday shipping for tomorrow, July 27th. 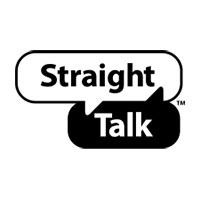 StraightTalk has become a popular alternative for those who don't need all the bells and whistles of flagship smartphones, or don't want the sometimes ruinous cost of keeping them connected. 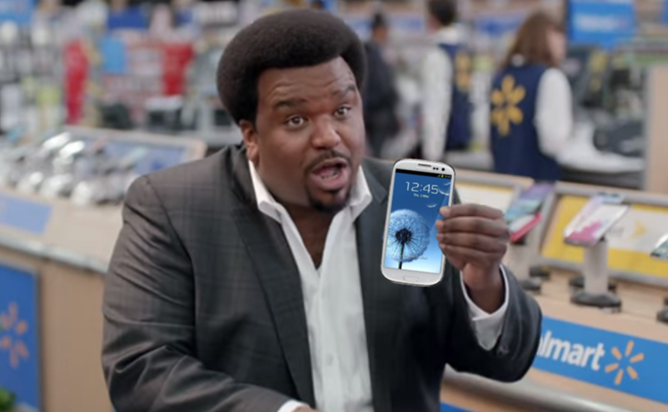 But even budget carriers move with the times, and the Wal-Mart partner looks like it's finally ready to embrace LTE. 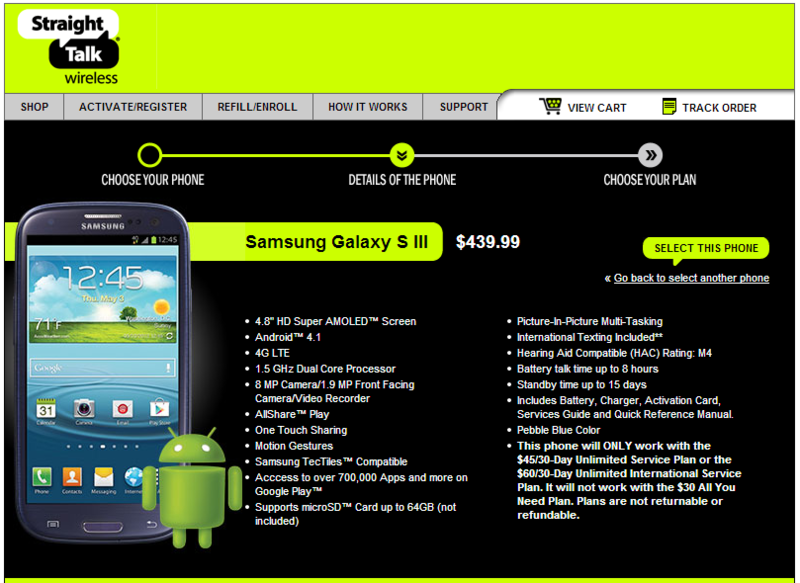 The Samsung Galaxy S III is now available for purchase on StraightTalk's website, and should be at your nearest Wal-Mart soon. The phone is unbranded and comes with a reasonable sticker price of $439.99 unsubsidized. There's just one fly in the ointment: It's a Sprint-compatible phone. The retail packaging for the GSIII popped up on HowardForums earlier today, and the LTE-S badge in the lower corner indicates that this model runs on Sprint's CDMA-LTE network. So far, the red Galaxy S III has been limited strictly to AT&T. If you wanted to get your hands on that device in the color that denotes danger and sexiness (you know, in keeping with the whole calming 'nature' theme), then two-thirds of U.S. mobile users would have to switch carriers. 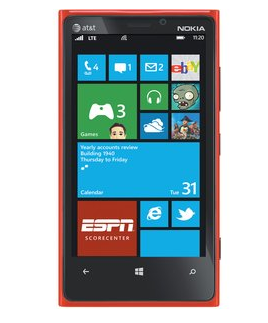 Now, however, you can get a red Galaxy S III 920 from Wal-Mart as long as you don't mind it being a Lumia 920, running Windows Phone, and not being a Galaxy S III at all. Someone at Wal-Mart is either very confused, very stupid, or brilliant and out to make Artem's day. Let's get the tough stuff out of the way up front. 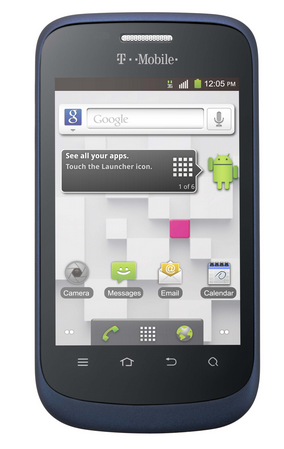 The T-Mobile Concord is manufactured by ZTE, runs Gingerbread, and packs a pretty meager 2MP camera. Don't worry, though. This phone shall not have been mortally wounded in vain. With a price of $99 off contract (with certain plans*) from T-Mobile or Wal-Mart, it doesn't look like too bad of a deal for smartphone users on a tight budget. If you're in the market, you can pick one of these up on August 26th. While most of our readers will be entirely uninterested in a Gingerbread phone made by ZTE, it's still very interesting to note that high-speed phones are becoming available for so little money. 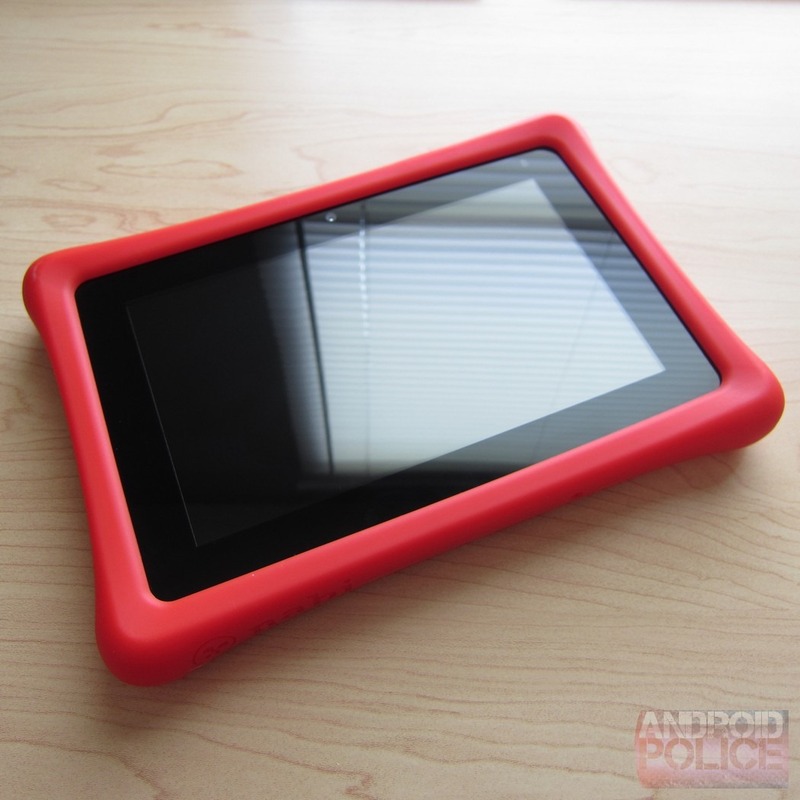 Typically, when we think about gadgets like this designed for children, Leapfrog comes to mind. Then there are the junk devices that use two-year old tech marketed as "for kids." 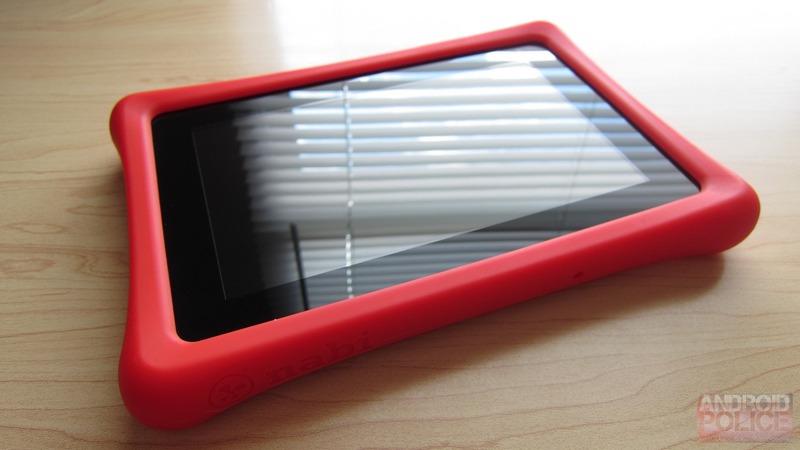 The Nabi 2 shatters that mold, however, by using the quad-core Tegra 3 processor to power the device. That, combined with an array of fantastic and educational software, puts this tiny powerhouse in a league of its own. Best of all: it does all that for only $199. After my review, many people wanted to know when this device would be available. Good news: you can now order the device from Wal-Mart, Best Buy, and Gamestop.